Today: The 40-second egg, and the perfect Mother's Day bonding experience. 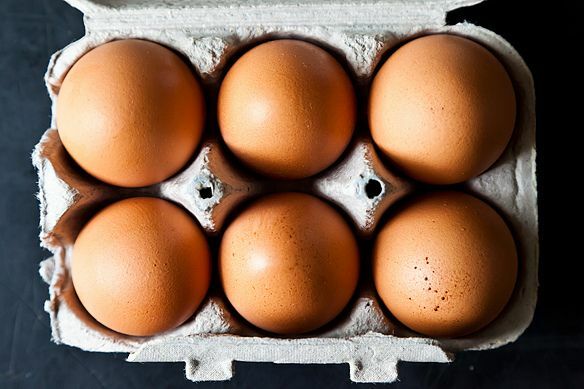 You may think there are a finite number—say, 6—ways to take your eggs. Breakfast is a multiple choice test, and diner waitresses and short order cooks aren't about to allow a write-in (not to mention busy moms and dads). 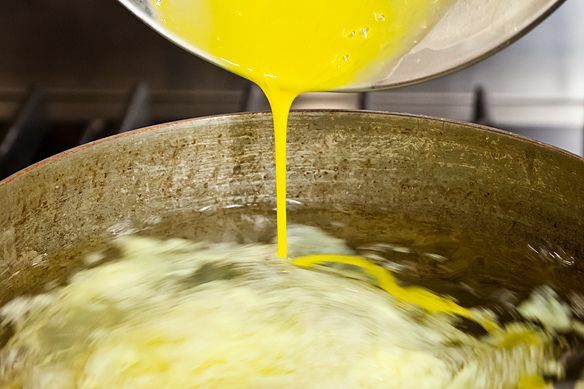 Sure, over time we've learned to improve upon the fundamentals, by frying eggs in olive oil or hard-cooking them judiciously rather than boiling their yolks out. But rarely has a new technique been rolled out, especially one that doesn't take 40 minutes. This one takes 40 seconds, give or take. 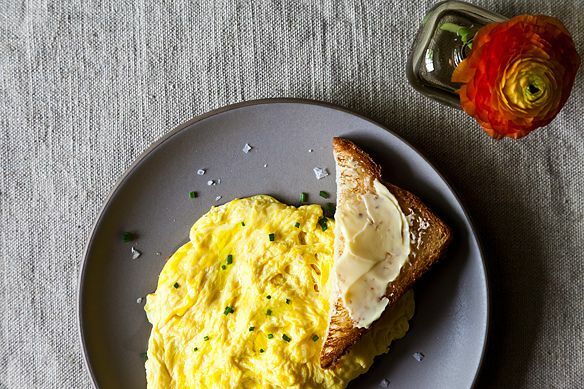 It's all thanks to an off-duty chef who got bored, started tinkering, and reinvented breakfast—with the quickest and fluffiest scrambled eggs imaginable. Adding to their mystique, they're also made without any fat at all (not that there's anything wrong with fat), and there's no crusty pan to clean. How could it be? This technique—a hybrid of poaching and scrambling—first came to San Francisco chef and writer Daniel Patterson out of necessity. As he explained in the New York Times Magazine in 2006, his then-fiancé made him throw away the Teflon pan he relied upon for scrambling, and he had to get resourceful. In the manner of the 6-minute egg and its variants, it's not such a stretch to call these 40-second eggs, because other than waiting for your water to boil, that's all the time they take. You barely have time to make toast! Now pay attention: You beat your eggs while counting to 20, swirl the boiling water, then slip in the eggs, pop on the lid, and wonder what's going on in there. 20 seconds later, de-lidded, you have a poufed cloud of eggs, ready to be drained and seasoned to your liking. • As written, Patterson's recipe uses four eggs and serves two, but you can always go with five eggs and invite a hungry friend; or two and dine alone; or one to fold into a killer breakfast sandwich. • Patterson instructs you to drain away your thin egg whites (see above), lest they go skittering off in the water, but I've skipped this step with relatively fresh eggs and not regretted my laze. • Depending on how you plan to dress them up, you can salt the water to taste without threatening the integrity of your eggs. Assuming you're serving them minimally, with just a ribbon of olive oil and sprinkle of flaky salt, go ahead and salt the water till it tastes like the sea, as you would for boiling pasta or blanching vegetables. When Patterson occasionally serves them at his restaurant Coi, it's with vinegary grated radish, seaweed powder, radish flowers, and chicken jus infused with katsuobushi. Too much salt in the water would just get in the way. 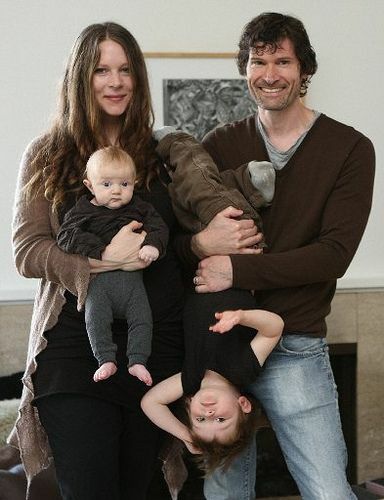 But six years after stumbling upon the technique, Patterson most often poach-scrambles eggs at home, both for his buddies (like when René Redzepi and Peter Meehan came over to hang out for this Food & Wine article) and for his two young children (Louise, 16 months, and Julian, 3 1/2—see above!). And no wonder: it's the 40-second breakfast, after all. It's as wondrous to kids as it is to adults, which makes it the perfect Mother's Day bonding experience (hint, hint). A grownup might need to handle the boiling water, but the kids can crack and whisk the eggs, butter the toast, and watch the magic unfurl from a safe distance. And, of course, trot it off to mom, with toast and coffee on the side. Just tried it with 7 eggs. Served one, because half the eggs went down the plug hole. I'm pretty good a scrambling eggs the normal human way, it is much better because you can see exactly how the eggs are cooking. This way, frankly, seems purely hipster. This is an excellent way to cook your eggs. I have been poaching my scrambled eggs for the last year and I love it for a number of reasons. I find it to be texturally superior to the pan-scrambled egg: it's moist, it's light, and it's perfectly eggy. It's everything a scrambled egg should be, but is often not. I find that it doesn't take any additional time, especially if you use a straight sided, shallow saute pan - more surface area and less water (an inch or two is all you really need) will heat more quickly. If you have the good [great] fortune of having a couple score of insect-eating, hard-working hens in the back yard, these eggs never have to be drained. Just use that morning's eggs! Alternatively, your farmer's market will often label eggs as "fresh" (usually less than two weeks old). These work well, too! 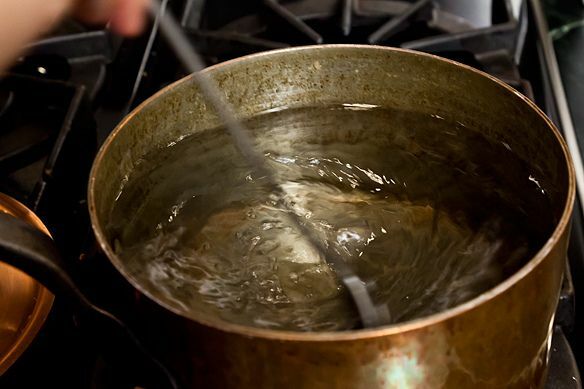 A strainer in the boiling water can also help you skip two steps here. Trouble is, it has to fit just right! It is a "fun" way to make eggs, but too precious. Just scramble the f***k eggs and be done with it! I love poached eggs. I place a smail amount of water into a custard size dish. Break 2 eggs into dish then place a small coffee cup sized saucer over bowl for a lid. Cook one minute 10 & secs in micro ! 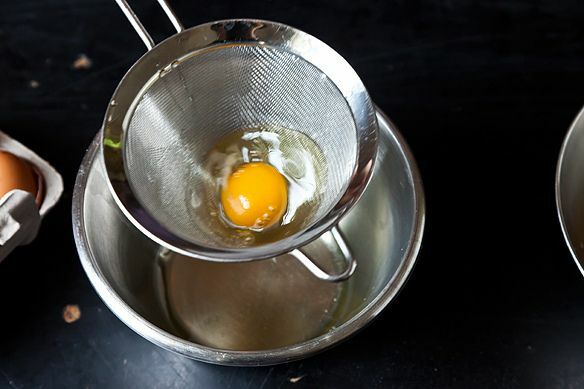 Remove with hot mitts ,strain remaining water from bowl by tilting over sink using a fork to not lose eggs. Then eat from bowl or slide onto a plate. 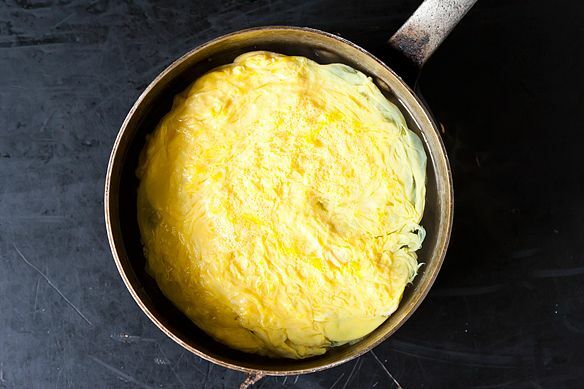 Making an omelet or scrambled eggs the Julia Child method..whisk whole eggs together and slide into a buttered or oiled preheated non-stick pan.Partially cook eggs, then add a little cream or milk and continue cooking by lifting the edge for an omelet or stirring gently for scrambled..until just cooked. If it's a omelet, fold it in half and slide onto a plate. Creamy and delicious! 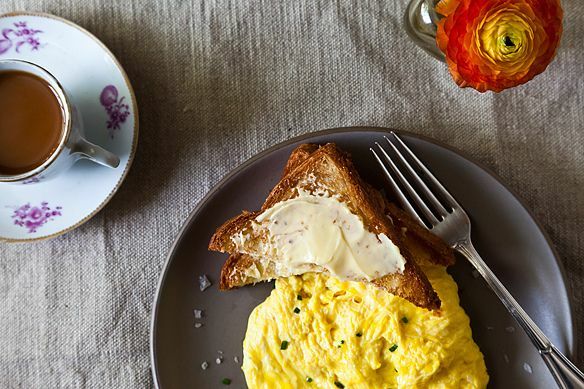 Best scrambled eggs recipe ever is on Food52 - it's called Merrill's Scrambled Eggs, I believe. Super easy and delicious - really, really delicious! Listen, all of you guys eggs lovers, I am one too. 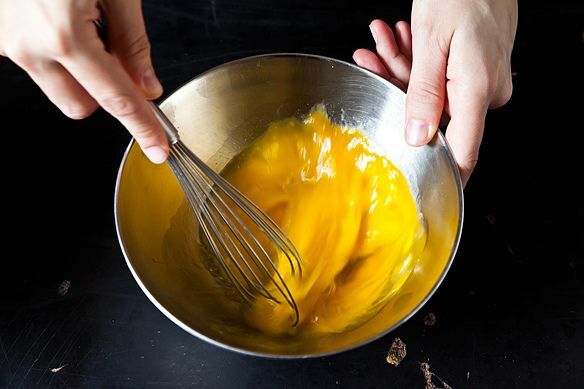 Beat your eggs well until very smooth like a cream. Take a double boiler. Once the water boils, take a wooden spoon and pour the eggs in the top container. No butter or oil necessary. Put the water on simmer and keep turning the eggs with that spoon. Do not overcook. Keep the mixture creamy and soft. Add a touch of salt at the end. You will have the best PURE TASTE of eggs. No addition of anything necessary ! Let me know after you try ... It will blow your mind and your palate ! I am French and this is how we do scramble eggs in the old country. I've tried this 3 times. In the time it takes for the water to come to a boil you can scramble eggs the "regular" way, so it's not much of a time saver. The eggs taste bland to me, even with the addition of the olive oil and salt. Draining them is an extra step that only adds more time. Forty seconds my foot. Not worth the bother. I really love scrambled eggs every morning...There's something that I always add in my scrambled egg..I add some mayo and creamer to make it fluffier and tastier! And my kids really love the taste of it! I've learned at www.gourmetrecipe.com . They have lots of exciting and interesting recipes for you to choose from! You can even watch its recipe videos and replay it again and again. Chow! Sorry, but the way we executed these eggs we got reconstituted eggs, buffet-line eggs. I don't know what we did wrong! I love eggs just about every way ... except browned when scrambled. This recipe totally eliminates that problem. Just made this "for one". In an effort to save a few calories (food 52 blasphemy?) I used one full egg plus one egg white. I skipped the pre-cook drain step and whisked eggs for close to a minute. It worked great. Good olive, a little kosher salt, and a sprinkling of Maldon salt really help here. Served on a bed of lemony steamed spinach. Wow, this looks like a lot of work to me and you end up with poached eggs; not really scrambled. If you like poached eggs this is probably much better tasting than traditional ones. But if I want scrambled eggs I want them to be really tender. A couple of years ago I saw Ina Garten add cream to her scrambled eggs and I've been hooked ever since. I just beat up the eggs, add a dash of cream (I use heavy cream), add a good pinch of Kosher salt, fresh ground pepper and a pinch of herbs de Provence. Quantities proportionate with the number of eggs you want to cook. Melt a good bit of butter over medium-high heat and stir gently with a rubber spatula until just set. Don't let them get dry. Maybe it takes a minute or 2 at the most, but you end up with scrambled eggs that melt in your mouth. Try them this way! You won't regret it. I tried this trick this morning. My boyfriend and WE LOVED IT! It is officially my new favourite way to cook eggs! I made these for breakfast. First of all they were fun! Second, it gave me a chance to use this great olive oil that I have. Third, toast and good butter. Perfect!